Combine classic Italian flavors with your favorite vegetables. Lightly coat a 9 x 13 rectangular baking dish with cooking spray. (I prefer to use disposable tinfoil trays for easier clean up). Slice zucchini ends and discard. Slice zucchini lengthwise into 1/4" thick strips (leaving skin on). Place first layer of zucchini in tray and sprinkle with salt, pepper, and Italian seasoning. Place layer of sliced mushrooms on top of zucchini and sprinkle with garlic powder. Place second layer of zucchini on top of mushrooms and sprinkle with salt, pepper, and Italian seasoning. Pour marina sauce over zucchini. Top sauce with a layer of sliced tomatoes. 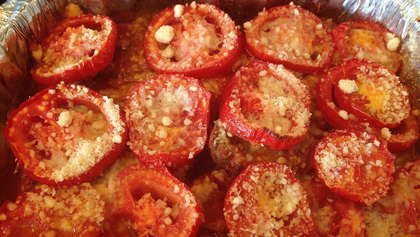 Sprinkle tomatoes generously with grated cheese. Bake in oven uncovered for 50-60 minutes until vegetables are tender. Let sit for 5 minutes, than drain access liquid before serving (if desired).